Gorkha Janmukti Morcha president Bimal Gurung today said time had come for everyone to become proactive for a statehood struggle as he asked teachers and heads of primary and secondary schools of the hills to discuss the matter and make preparations. Gurung has announced he would be resigning as the Gorkhaland Territorial Administration chief executive within two months and spearhead a fresh agitation for a separate state. Today, he brought up the statehood agitation issue during a Teacher’s Day programme organised by the Gorkha Primary Teachers Organisation (GPTO) to felicitate retiring teachers at the Gorkha Ranga Manch Bhawan in Darjeeling. While laying emphasis on the need to strengthen the education system at the primary level, Gurung pointed at the importance of teachers in making youngsters aware of the statehood demand. He asked teachers and heads of schools to attend a meeting on September 11 to discuss about the separate state issue. “The atmosphere is such that I have to work quickly and be proactive for a separate state. Teachers will have to play an important role. This is why I request all the teachers and heads of schools to attend a meeting on September 11 to discuss the issue and prepare our strategy,” the GJM president said. In the second phase of the GJM’s agitation in July 2013 after the UPA government decided to create a Telangana state, schools in the hills had to suffer for a month as they were forced shut. In fact, Gurung had asked schools, specifically the English medium boarding institutions, to send their boarding students home. It was only after several meetings between heads of schools and the GJM president that normalcy was restored and schools allowed to reopen from September. Stressing on the pertinence of preserving and safeguarding the culture and language of the community, which he said was different from others, the Gurung said he had placed these facts before Prime Minister Narendra Modi. “We (Gorkhas) are different in language and culture from others. We need to safeguard our uniqueness. 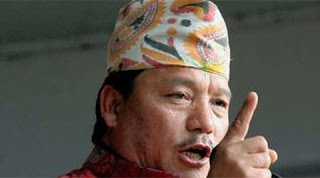 That is why I have requested the PM to take this into consideration and take a stand on the statehood issue,” Gurung said today. Chief minister Mamata Banerjee has already warned any disturbances in the hills would be dealt with sternly. In 2013 too, Banerjee had taken strict measures to curb the agitation by getting senior GJM leaders arrested. But a defiant Gurung today said he was ready to die for the statehood demand. “This time nothing will deter my decision even if it means I have to die for it. I will continue my struggle for a separate state till we achieve it,” he asserted. An illiterate calls a meeting of heads of school. Wants Gorkhaland, can you (Bimal) spell Gorkhaland, the idiot. Its long gone now, your party is finished and your end will be like Ghising, I promise you. Your time is up.